What is "the Java tutorial"? Where can I get the tutorial? What do I need to know about the books before I buy one? What's the difference between the 1st and 2nd editions of the book? How much does the tutorial cost? What version of the JDK does the tutorial reflect? What topics are covered by the tutorial? Some of the online tutorial isn't finished. What's up with that? Where can I find more information about the book? What awards has the tutorial won? How do I download the tutorial? May I mirror the tutorial publicly? I'm having trouble downloading the tutorial. What should I do? I'm having trouble unarchiving the tutorial. What should I do? What do I need to know about the online version before I download it? Can I get the tutorial in WinHelp format? Can I get a PostScript or PDF version of the tutorial to download? Why isn't the tutorial available in PostScript or PDF? Who are the members of the tutorial team? Is there any more information about the authors? What's this I hear about the tutorial babies? How do I contact the authors? Khwarazm and Me? Who are they? Can you help me with my Java programming problem? What do other readers think of the tutorial? Where's the change history for the tutorial? The online version--A hyperlinked, interactive, set of HTML pages available on the World-Wide Web. The current version documents the JDK 1.1 release, except where noted otherwise. The book--The first edition of The Java(tm) Tutorial was published in the summer of 1996 and covers the JDK 1.0.2. The second edition covers JDK 1.1 and is now available in bookstores. You can read the tutorial on-line. Start at the trail map: The Java Tutorial. If you prefer to view it on your own system, you can download the tutorial free of charge. If you prefer to read paper, you can buy the book. The first edition is over 800 pages long, lists at about $40 (U.S.), and includes a CD-ROM. This edition covers the JDK 1.0.2. The book has been superceded by the second edition. The second edition is almost 1000 pages long, lists at about $47 (U.S.), and includes a CD-ROM. This edition covers the JDK 1.1. The book and is now available in bookstores, or you can order it through amazon.com. Just ask for The Java Tutorial Second Edition by Mary Campione and Kathy Walrath, published by Addison-Wesley, ISBN #0-201-31007-4. Which one should I start with being a Java Newbie? Does the 2nd include the same lessons and introductory lessons as the first? In general, we recommend that you get the 2nd edition of the book if you can find it, unless you need to use 1.0.2, for some reason. The only compelling reason I can think of to use 1.0.2 is for writing applets for wide release over the internet to people who might be using old browsers. The 1st edition covers 1.0.2, and the 2nd edition covers 1.1. The differences aren't huge, but they do exist, especially in GUI creation and native methods. We think that, aside from being more up-to-date, the 2nd edition is just better. We added a section on what's interesting about Java, and we significantly rewrote/reorganized some of the lessons. You can view the online version free and you can download it free (well, excluding connect charges and the like). The first edition of the book retails for about $40 (U.S.). The second edition retails for about $47 (U.S.). Both books include a CD-ROM that contains the online version. Except where otherwise noted, the online tutorial reflects the API distributed in the 1.1 Java Developers Kit (JDK). The first edition of the book documents JDK 1.0.2. The second edition of the book documents JDK 1.1. The online tutorial is a dynamic growing document. Read more about that in This Is a Work in Progress!. Information about both editions of the book are available online. Choose the book.html file for the edition that interests you. These pages will point you to other pages that include information about the contents of the CD-ROM, a list of known errata, and the table of contents for the book. The second edition of The Java Tutorial won an Achievement Award in the "Single-Issue Publications" category. The award was given on February 27th, 1999, by the Society of Technical Communications (STC). On February 21st, 1998 the Northern California branch of the Society for Technical Communications (STC) announced their awards. The first edition of The Java Tutorial won a Merit Award in the category "Single-Issue Publications" (better known as retail books). In August of 1997, JavaWorld Magazine chose the first edition of The Java Tutorial as a runner-up for Best Training Aid. See Download the Tutorial for information. Unfortunately, we cannot send the tutorial to individuals via e-mail. If for some reason, you cannot download the tutorial from the web, consider buying the book and using the version of the tutorial contained on the CD-ROM included with the book. Note: If you download the tutorial, feel free to make it available locally at your site. Please do not publicly mirror it to the Web!. See the next question and answer to find out why. Our policy on distribution is that anyone is permitted have a copy of the online tutorial as long as it's visible only within their own institution (university, business, or whatever) and no one is profiting from the tutorial's distribution. We've taken this strict position because the many tutorial mirrors mean that search engines generally don't find the most up-to-date version of the tutorial. Instead, search engines find mirror sites, which invariably fall behind. We end up getting e-mail about problems that have been corrected in newer versions of the tutorial. Or perhaps worse, we don't get e-mail and the reputation of the tutorial suffers. We allow local copies because we realize that browsing java.sun.com isn't always practical. When you tell us about a mirror, we send the offender a friendly e-mail asking them to please move their copy of the tutorial to a place that isn't visible from the outside world. Go to http://java.sun.com/feedback/sitecomments.html and submit a trouble report. Describe exactly what the problem is. They can't help you if you don't give them enough information. Make sure you tell them the hardware platform, operating system, and browser you're using. Go to http://java.sun.com/feedback/sitecomments.html and submit a trouble report. Make sure you indicate what hardware platform, operating system, and tools you're using to unarchive the tutorial files. About 16.2 Megabytes of descriptions, Java code examples, and running programs. Yes. With our authorization, Franck Allimant has kindly made the tutorial available in WinHelp format. Visit http://www.confluent.fr/javadoc/ for information and to download. No. If you want a hard copy of the tutorial, you can buy or borrow the book. To find out why, read the next question and answer. We used to offer a PostScript version of the tutorial, but it caused many more problems than it solved. There were problems with fonts, page size in Europe, older versions of PostScript, and so on. PDF format might solve some or all of those problems, but we also got a lot of complaints about the actual document: "it's just a PostScript dump of the HTML," "the links don't make sense on paper," and so on. PDF wouldn't solve those problems. As a result, we no longer provide PostScript, and we won't be providing it or PDF in the future. Bios and a picture of the core tutorial team appear below. For information about our distinguished contributing authors, read our bios page. Lisa Friendly is the Manager of Technical Publications for the JavaSoft division of Sun Microsystems. She joined the Java project in 1993 as a writer where she worked on the design of the javadoc tool for automatic API generation. In 1995 she inaugurated the Java Series and is the Series Editor. Mary Campione, a technical writer on the JavaSoft team at Sun Microsystems, specializes in writing programmer's documentation for emerging software technologies. Among her other books, she is the co-author of PostScript by Example. Kathy Walrath is a technical writer on the JavaSoft team at Sun Microsystems, specializing in how-to guides for programmers.Before joining Sun as one of the first writers on the Java project, she wrote extensively about Unix, Mach, and NextStep. Alison Huml is the latest addition to the tutorial team. Prior to joining Sun Microsystems, she worked as a technical writer at various startups, including Black Sun Interactive. She specializes in documentation designed for the Web and is currently pursuing a masters degree in Computer Science. 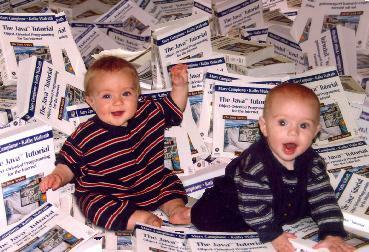 In January of 1998, the Java Web site featured this article about the tutorial and the authors. On March 4, 1997, the The Java Developer Connection interviewed Kathy and Mary about their work on the tutorial. Read the transcript of that interview. Note: You may be required to register and/or log in to view the transcript. But hey. It's free! Also, you can read interviews with Mary and Kathy at Amazon.com. Cosmo, born June 11, 1996, is Kathy's second child. Sophia, born May 25, 1996, is Mary's first child. The Java Tutorial, first published in the Summer of 1996. You can send mail to our tutorial e-mail address: tutorial@java.sun.com Before contacting us, read This Is a Work in Progress! Khwarazm and me are FrameMaker's suggested respellings of Kathy and Mary's login names. For a long time, we had no idea what Khwarazm meant, but several readers wrote in to educate us. Khwarazm is the name both of a Central Asian city (now Khiva, Uzbekistan) and of a Persian mathematician born in that city around 780 A.D. The mathematician, Mohammed ibn-Musa al Khwarazm, is credited with introducing the Hindu Arabic decimal number system to the West, and the concept of zero into Arab mathematics. The term algebra is taken from part of the title (al-jabr) of one of his books. The word "algorithm" is derived from his name, which is alternately spelled al-Khwarizmi and al Khawrizm. Here's my code. Can you help me debug it? How do I set up my CLASSPATH? How do I set up the compiler? How do I install Windows 95? Where do I get the JDK 1.1? When I try to run one of the tutorial examples on a PC/Mac/Sun it doesn't work at all. Help me. I want to write a <<insert description of some program here>>. Where do I begin? I'm taking a class and I need help learning Java. My boss told me to find out about Java. What is Java? Where do I get it? Unfortunately we are not staffed to provide answers to these types of questions at this address. Here's our auto-reply. This message lists a bunch of Java developer. resources to help you get an answer to your question. By the way, we tested all of the examples in the book on Suns, Macs, and PCs. The examples work for us. If you are having problems with the examples, then you are probably having configuration problems. We get a fair number of messages to our e-mail address, tutorial@java.sun.com, from people attempting to subscribe. Our e-mail address is not a subscription address. It's a way for you to reach us. If you are looking for developer resources try some of the ones listed in our auto-reply. Here are a few comments from some of our readers about the first edition of the book. You can also read comments submitted to amazon.com by readers: about the second edition. Read a complete change history of the tutorial.